Radiation fog developed over the Piedmont of Virgina on the morning of 30 September in a region with little pressure gradient. 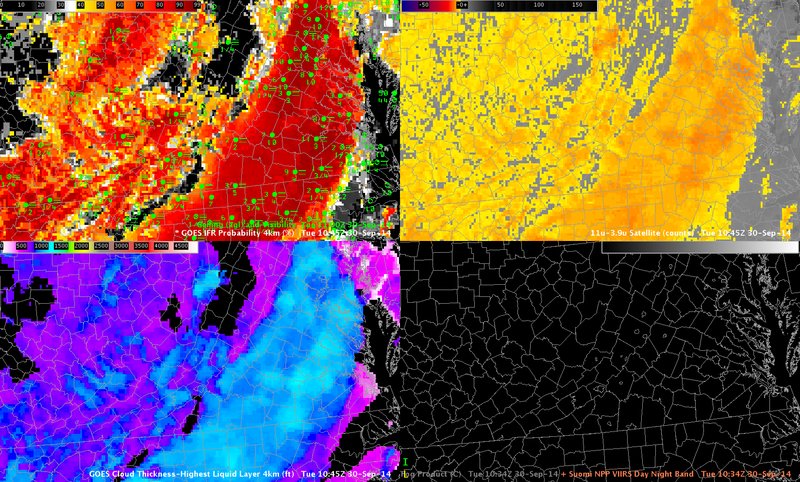 The image above, from 0715 UTC, shows IFR Probability to be very high (from 85-95%) over the Virginia Piedmont. 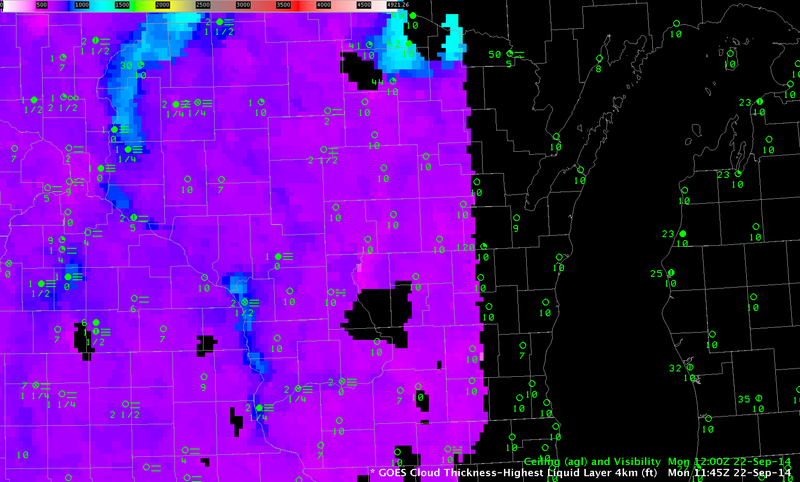 Numerous stations in the region were reporting IFR visibilities and ceilings. Brightness Temperature Difference products are also highlighting the region (Note the advantage in the Suomi NPP Brightness Temperature Difference field that ably captures fine detail related to Ridge/Valley topography over the Appalachians); the advantage of IFR Probability fields is that it includes surface information so that someone using the field can be more certain that the stratus detected by the satellite is in contact with the ground as fog. The animation below shows the evolution of the fields from 0200 through 0700 UTC. GOES-R Cloud Thickness (the thickness of the highest water-based cloud) can be used to estimate when fog/low clouds will burn off. The estimate is most accurate for strict radiation fog. GOES-R Cloud Thickness is only computed for water-based clouds during non-twilight times (in other words, it is not computed in the hours surrounding twilight at both sunrise and sunset). The last value of Cloud Thickness before morning twilight (shown below) can be used in concert with this scatterplot to guess when clouds might dissipate. Values over eastern Virginia, near Richmond, exceeding 1100 feet, correspond to a dissipation time 4+ hours after 1100 UTC, or at 1500 UTC. In this case, that value was an underestimate. This entry was posted in Mid-Atlantic, Suomi/NPP on September 30, 2014 by Scott Lindstrom. 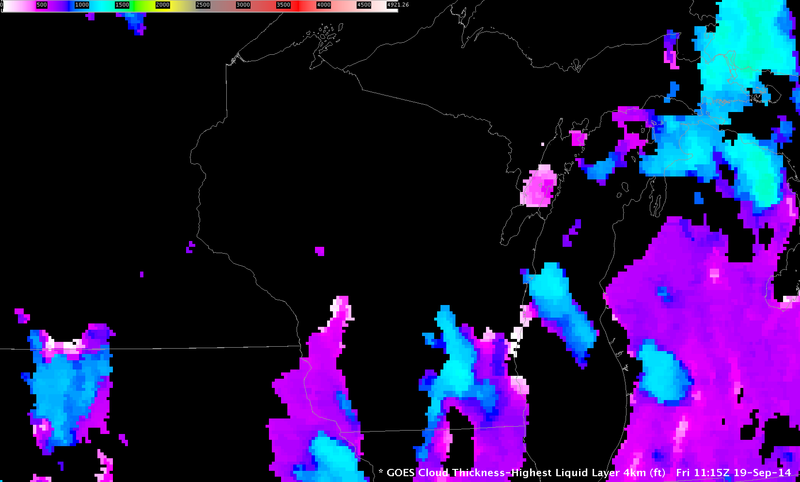 Note how the IFR Probability fields ignore regions of mid-level stratus, such as over northeast Ohio along Lake Erie. Suomi NPP Overflew the region as well. GOES-R IFR Probability algorithms do not yet incorporate Suomi NPP data; when that happens, an early morning snapshot that complements MODIS overpasses will be available. This entry was posted in Midwest, MODIS, Suomi/NPP on September 26, 2014 by Scott Lindstrom. 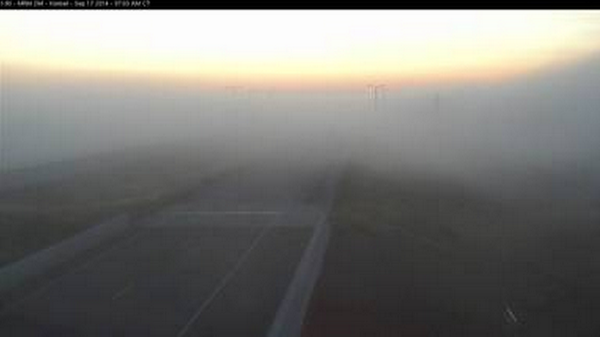 The NWS Office in Sioux Falls tweeted a picture of fog near Kimball, SD, in Brule County (below). 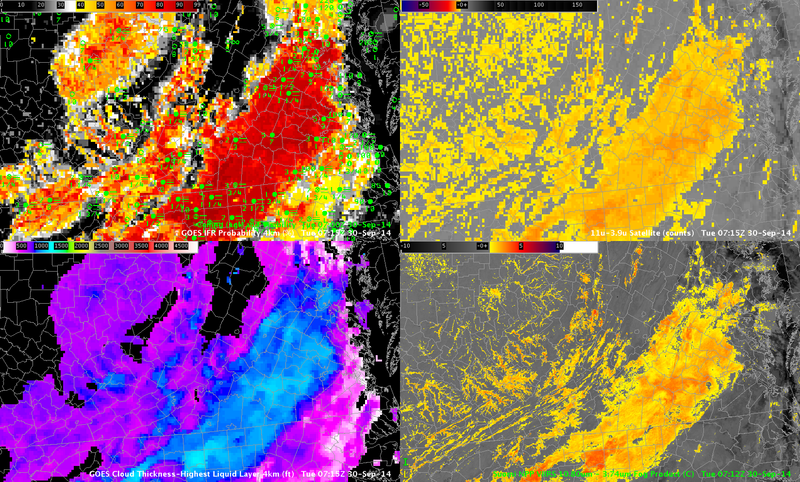 The toggle below shows the Brightness Temperature Difference Field from GOES-13 (10.7 µm – 3.9 µm) and the GOES-R IFR Probability fields computed using data from GOES-13 and the Rapid Refresh Model. The Brightness Temperature Difference field detects the presence of water-based clouds (yellow and orange in the enhancement used) and works because such clouds have difference emissivity properties at 3.9 µm and 10.7 µm. Temperatures inferred from the 3.9 µm radiation detected are cooler than those temperatures inferred from the 10.7 µm radiation because water-based clouds do not emit 3.9 µm radiation as blackbodies. The Brightness Temperature Difference field gives information about the top of the cloud only, however, and it typically overestimates regions of fog/low stratus. That is the case on the morning of 17 September 2014. For example, IFR Conditions are not reported over much of southeastern South Dakota or western Minnesota along Interstate 90. The IFR Probability algorithm is correctly minimizing the influence of the strong brightness temperature difference signal there because Rapid Refresh Data is not showing boundary-layer saturation. The highest IFR Probabilities in South Dakota are associated with reported IFR Conditions, for example at Chamberlain, SD (west of Kimball SD and also in Brule County) and at Aberdeen in northeastern South Dakota. This entry was posted in Uncategorized on September 17, 2014 by Scott Lindstrom. Brightness Temperature Difference Fields from GOES-13 show large regions over Pennsylvania and surrounding states during the early morning hours of September 15th. (Note that the image at 0515 UTC, not in the loop above, shows the effect of stray light). 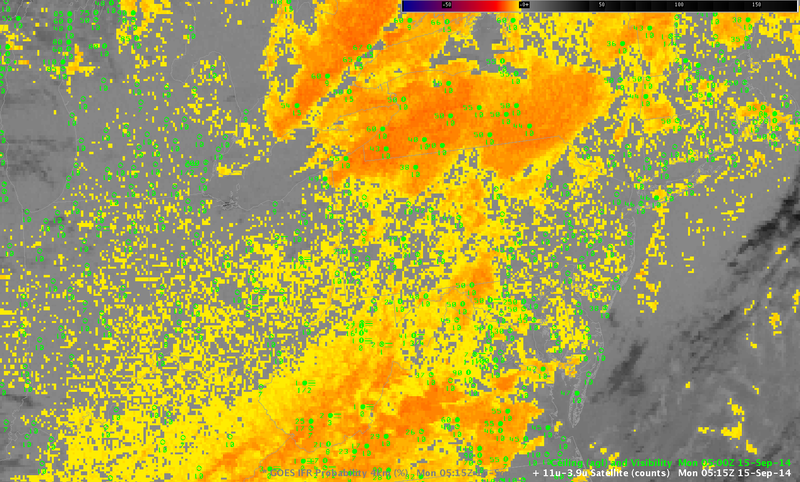 If you look at the ceilings and visibilities in the imagery above, you will note that many regions where stratus/fog are indicated by the brightness temperature difference field (over upstate NY, for example), do not in fact show anything near IFR conditions. Always recall that the satellite is seeing the top of the cloud deck; whether or not that cloud extends to the surface is beyond the capability of present satellite systems. (You can infer it sometimes, of course, especially if the signal is confined to a narrow river valley, as occurs in the animation above: The Ohio River along the northern panhandle of West Virginia shows up very well). IFR Probability fields for the same time do a better job of highlighting only where reduced ceilings and visibilities are present. For example, the region of stratus over upstate New York is screened out, as well as the region over southern and southeastern Virginia. Probabilities are also quite high over the Ohio River Valley, where river fog is likely occurring. Note that IFR Probabilities over southwestern Indiana at the end of the animation have the characteristic look (a flat field) associated with IFR Probabilities created without the benefit of satellite data. MODIS data were able to provide a a high-resolution image of this scene in the middle of the night. As with GOES, MODIS identified the large region of stratus over upstate New York and over southeastern Virginia, and the IFR Probabilities correctly screened out those stratus clouds. River Valleys show up distinctly along the Ohio River downriver from Pennsylvania; smaller IFR Probabilities surround the rivers. Sometimes MODIS data can give an early alert to the development of fog; in the present case, when MODIS overflew the region, fog development was at sufficiently large a scale that GOES-13 could also detect it. Suomi NPP data also viewed the developing river fogs, both in the day/night band, and in the brightness temperature difference (11.35 µm – 3.74 µm), below. At present, IFR Probabilities are not computed from Suomi NPP satellite data. This entry was posted in Day/Night Band, Mid-Atlantic, MODIS, Suomi/NPP on September 15, 2014 by Scott Lindstrom. The approach of an extratropical cyclone, such as the Colorado Cyclone in this animation in the upper Midwest on 10 September 2014, will frequently result in areas of IFR or near-IFR conditions. However, the many cloud layers that accompany these baroclinic disturbances will always make difficult the task of identifying (using satellite imagery) regions of low stratus and fog. 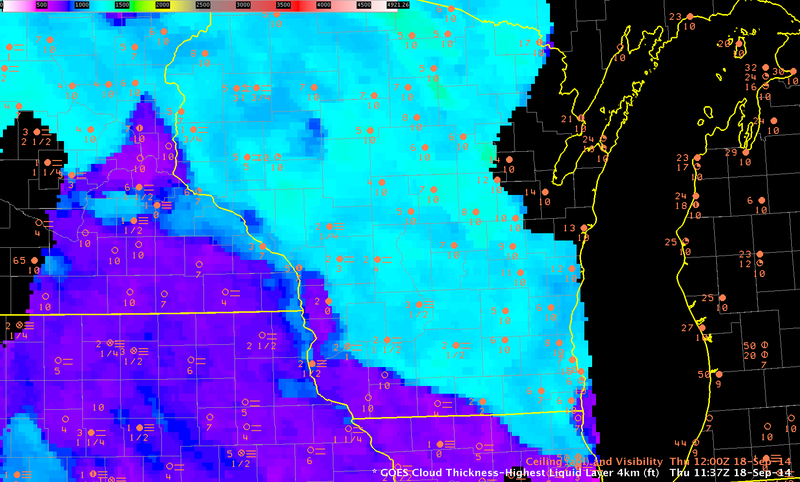 Consider the animation below of Brightness Temperature Difference (10.7µm – 3.9µm) fields (a traditional method of detecting water-based clouds) over the Upper Midwest on 10 September. Interpretation of this loop is time-consuming. Not only is there little distinct signal related to observed IFR and near-IFR conditions, but the rising sun (at the end of the animation) causes the Brightness Temperature Difference to flip sign, altering the enhancement. There are regions where the Brightness Temperature Difference field detects water-based clouds that may be associated with fog or stratus, chiefly over the western third of the domain (and especially over the Dakotas) in the later half of the animation. Compare the animation above to the loop of IFR Probabilities for the same time period below. IFR Probabilities are highest where near-IFR or IFR conditions are present, and the IFR Probability field screens out regions where low stratus (but not fog) is present, such as over the Dakotas at the end of the animation. Regions where IFR Probability fields have a flat character — such as over Wisconsin around sunrise — are where only Rapid Refresh model data (but not satellite data) are used as predictors, and the field does not have pixel-scale variability. Because fewer predictors are used, the magnitude of the IFR Probability is smaller than in regions where both satellite and model data can be used as Predictors. Thus, a flat field (over eastern Wisconsin at the end of the animation, or over Iowa at the beginning) has values that should be interpreted differently from similar values in regions where both satellite and model data can be used in the computation of IFR Probabilities. This entry was posted in Multiple Cloud Layers, Northern Plains, Plains on September 10, 2014 by Scott Lindstrom. When multiple cloud layers are present, such as when a cirrus shield overlays a region, the traditional method of detecting fog/low stratus, the brightness temperature difference product, struggles to identify regions of low clouds because the satellite sees only the signature of the high clouds. Low clouds are hidden from view. In such cases, it is vital to incorporate low-level information to identify regions where fog/low stratus might be present. The required low-level information can come from the model fields of the Rapid Refresh Model. The model predictors can be used to generate IFR Probabilities in regions where satellite predictors are unavailable because of the presence of high clouds. In the toggle above, the Brightness Temperature Difference field shows high clouds over Georgia and the Carolinas. IFR Probabilities in this region are around 50% — relatively low because Cloud Predictors cannot be used in the algorithm. But IFR Conditions are present over North and South Carolina. Tailor your interpretation of the IFR Probability values to account for which predictors are used. Over Tennessee, IFR Probabilities are much higher. In this region, satellite predictors can be used, and a strong satellite signal is present. IFR Conditions are not widespread, however. Use the IFR Probability field as one tool (but not the only tool) when making nowcasts about the possibilities of fog/low stratus. This entry was posted in Deep South, Multiple Cloud Layers on September 8, 2014 by Scott Lindstrom. GOES-based IFR Probabilities over Kansas before midnight on 2 September highlight two regions where IFR Conditions might be developing: over western Kansas, near the Colorado border, and over south-central Kansas. These would be two places to monitor most closely over the coming hours. The MODIS-based IFR Probabilities for the same time, below, can be used to refine the interpretation of the GOES fields. 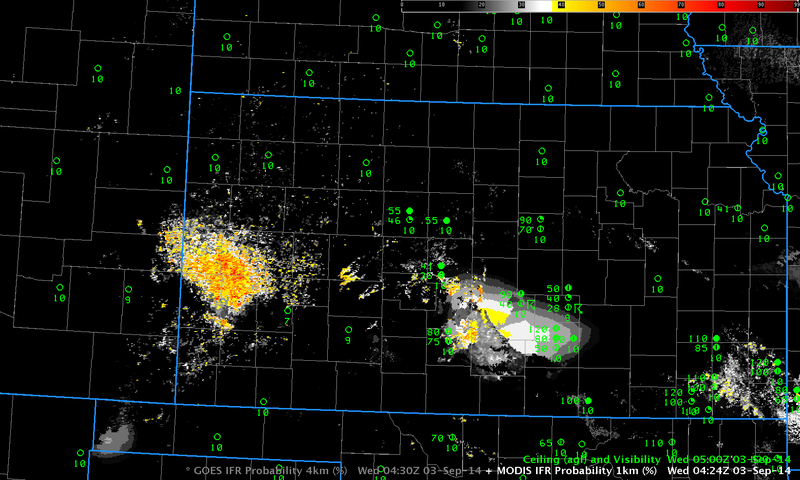 IFR probabilities over western Kansas are higher with the MODIS data. IFR Probabilities from MODIS better capture the difference in the field over south-central Kansas as well: there is a more obvious distinction between IFR Probabilities influenced solely by model output (because of the multiple cloud layers associated with the thunderstorm at Hutchinson and Newton) and those controlled by both model and satellite predictors. The strength of GOES-based IFR Probabilities is temporal continuity. How do the fields evolve with time? 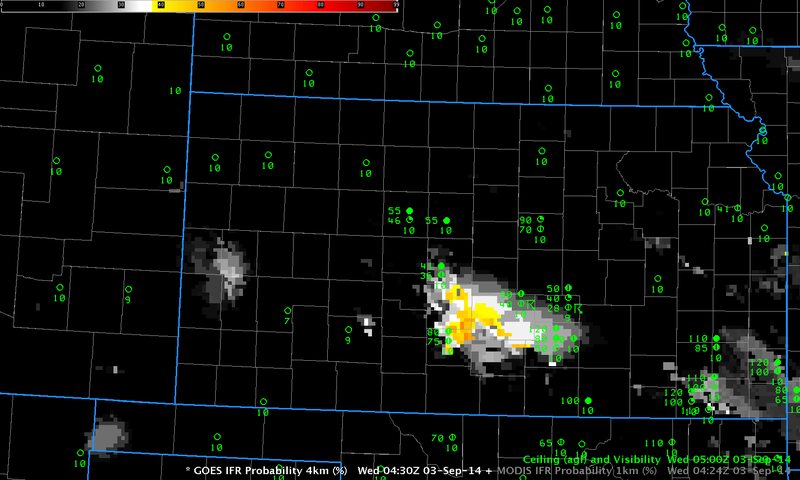 The animation below of GOES-based IFR Probabilities shows increasing values over western Kansas (the region drifts northward, as well); by 1045 UTC, at the end of the animation, IFR Probabilities are very high over western and northwestern Kansas, and IFR conditions are observed in the form of both low ceilings and reduced visibilities. 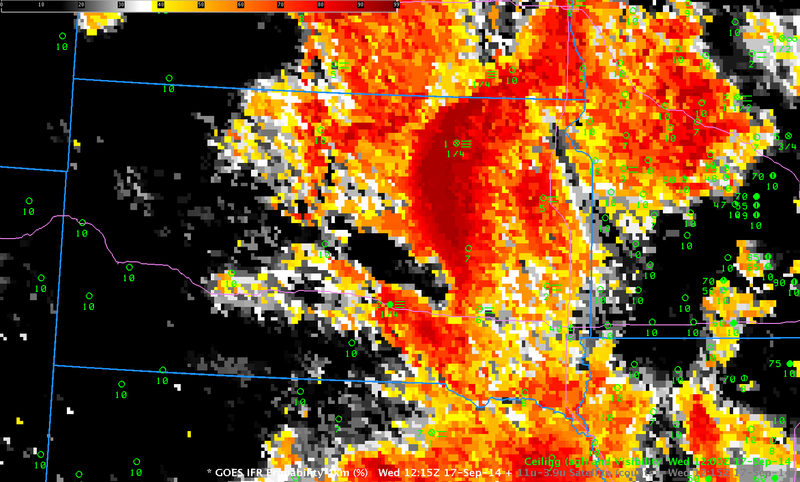 This was a case where MODIS data gave an early alert to where GOES-based IFR probabilities might later become high. 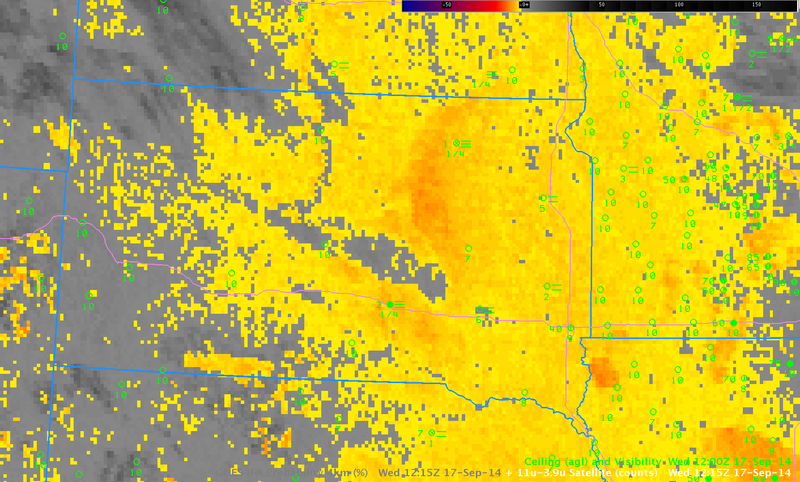 Fog can start at small scales and then grow in size and MODIS data offers an advantage of higher spatial resolution. A toggle between the MODIS and GOES-based IFR Probabilities at 0836 UTC is at bottom. This entry was posted in MODIS, Plains on September 3, 2014 by Scott Lindstrom. GOES-R IFR Probabilities (from GOES and from MODIS) over the Great Plains and southern Rockies indicated one region where IFR conditions were most likely: over the Texas panhandle, where IFR conditions were reported. There is a strong signal in the GOES-based Brightness Temperature Difference field there (and in the Suomi NPP Brightness Temperature Difference field) as well. There is also a Brightness Temperature difference signal in regions where IFR conditions are not occurring; in those locations, stratus is present, or (over the Rockies) emissivity differences in the dry soil are present, both of which conditions will lead to a signal in the brightness temperature difference that is unrelated to surface visibility and ceilings. This is therefore another example showing how incorporation of model data that accurately describes saturation (or near-saturation) in the lowest model layers can help the GOES-R IFR Probability more accurately depict where IFR conditions are present. This entry was posted in Day/Night Band, Plains, Rocky Mountains, Suomi/NPP on September 2, 2014 by Scott Lindstrom.